I was up early the next morning and at the main Rome train station almost an hour before my train was scheduled to leave. 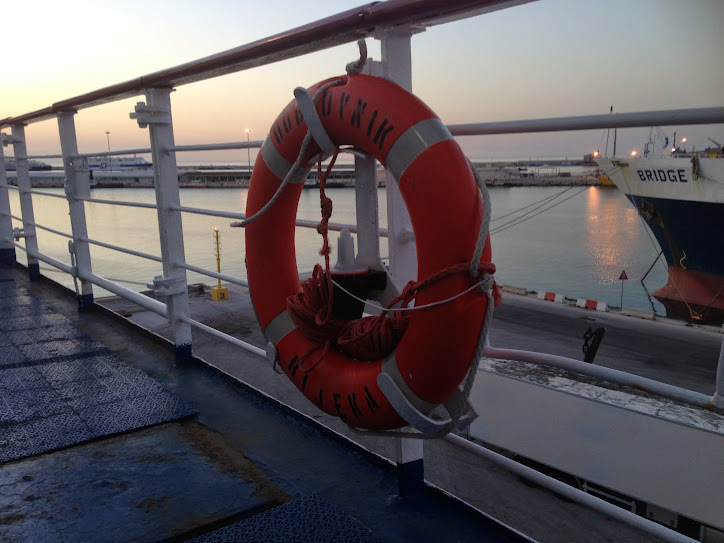 There was no way I wanted to fail for a second time at reaching Bari in time for my ferry. After getting on the wrong train just two days ago, I was a little paranoid. I felt the need to question the station staff that I was most definitely getting on the Bari train. Even though the train had signs on the doors saying Bari. And the electronic sign on the platform also said Bari. I may have also questioned one or two passengers on the train itself too. I just really did not want to screw up again. Six hours later I arrived into Bari. Yippee! The only downside was that it was only 3pm. My ferry wasn’t until 10pm so I had some time to kill. Bari is a rather small place so there wasn’t a heck of a lot to do. I mainly spent it sunbathing with a bit of wandering. I also had my last Italian gelato. Twice. Eventually I was able to check in at the ferry terminal and get on the ferry. 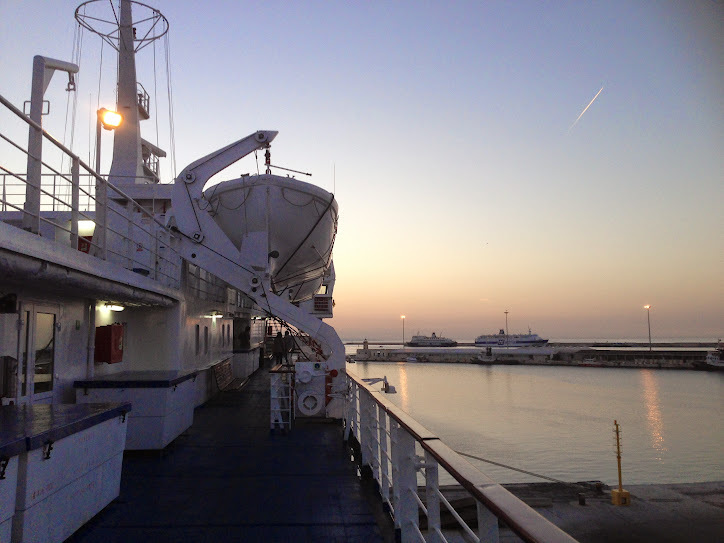 I snuggled up in my cozy cabin and fell asleep to the rocking of the boat as it sailed away from Italy. 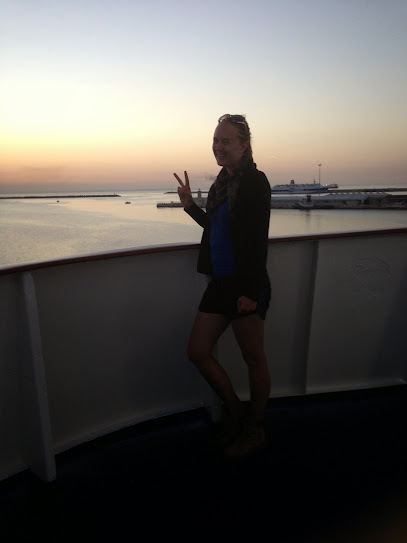 Can’t believe I really am on the boat! Price: €15 extra on top of the ferry ticket for a bed in a 4 bed cabin (which was half empty anyway). Overall: A little cramped. And possibly not for claustrophobics. But there’s no way I would do an overnight ferry without booking a bed. I also surprisingly sleep well being on a boat. And best of all, breakfast was included with this ferry company. Yum scrambled eggs! Roma Roma. And the worst day of my trip. 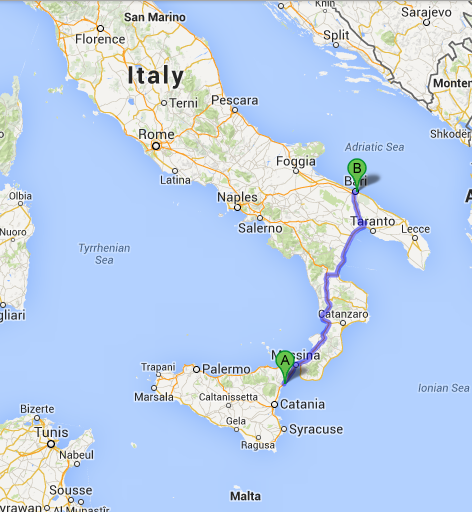 The last you heard, I had planned to travel 500 kilometres from Sicily to Bari. From the toe of the Italian boot right up to the far side of the ankle above the stiletto. It is a really freaking long way and difficult to get there easily. So I thought ahead and booked a hitchhiking car ride with Blablacar. It would have been perfect as the driver was going directly to Bari, and much faster and cheaper overall. 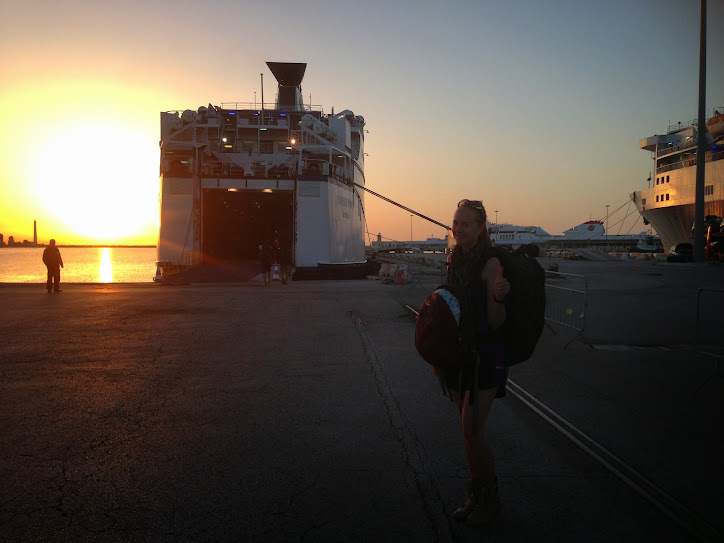 I would have made it to my planned 10pm ferry to Croatia that night easily with lots of time to spare, and most important, still had a sleep-in that morning. Instead what actually happened that morning is that the Blablacar driver cancelled the ride. He had some excuse about his flight being delayed due to a technical fault. I guess it was a good reason, and he did send the text message at 6am. But all I could think was SHIIIIIIIIT, and a few other choice words as suddenly my day had become much more stressful and expensive at only 9 o’clock in the morning. I had thirteen hours to try and make it to Bari. Less even if you take into consideration that the ferry recommends checking in two hours prior to guarantee your ticket. A quick breakfast as I knew I would need energy for the day ahead, some fast train/bus research, and I was out the door. I made the first three connections of my journey successfully (a train to Messina, a ferry across to Villa San Giovanni, then another train to Paola). It was just after 1pm by this stage and I still wasn’t even halfway. Then I made my big mistake. I brought the rest of all my connecting train tickets to Bari (another three different trains). There was only three minutes until the next train was supposed to leave and I got on the wrong train. Bugger. I didn’t even realise it was the wrong one for over twenty minutes. But it was too late by then. In Europe the way I figure out which train to get on at the stations is usually by looking at the train times on the main display board in the station. Usually the name of the train will be the final stop, but if you aren’t going there and you don’t happen to know the exact geography that well, then using the leaving time on your ticket is the easiest method to distinguish which train is yours. Also depending on the ticket you have, it might not even show the train number on it, and sometimes not even the date or time of the train you want. If you have time, occasionally the board shows all the other stations that the trains will stop at too as a slowly scrolling short line. This is sometimes also displayed on the individual electronic signs on each platform for each train. But you need a few minutes for this. I did not have a few minutes unfortunately. And there were two trains leaving at the same time as what was on my ticket. By the time I realised I was on the wrong train, and got off at the next station, I was a little upset. All the money I had just spent on tickets had gone down the drain (as they were mainly reservation-required trains meaning the tickets were only good for those specific trains). But I needed those specific trains as they were the only combination that would arrive in time for my ferry. Taking the next set of trains would have me arriving in Bari at 11pm. Which was too late. It was only 2pm. I still had eight hours until my ferry but I actually could not make it in time. Argh. I was wanting to scream and cry and have a big tanty in the middle of station. But that wasn’t going to achieve anything. My other plan B of hiring a car also didn’t work as for the security deposit you needed some silly amount in your credit account. I don’t even have a credit card (just debit cards) so that plan failed straight away as I deliberately keep a low amount of available money in my debit accounts for in case my cards are stolen. I couldn’t even find anywhere with free wifi near the station. Nobody knew enough English to understand what I was wanting when I asked them where I could go for wifi. They just said no. Or stared at me. Not terribly helpful at all. But I guess it was a small town. Maybe the internet hadn’t reached it yet. I came up with a plan C. I realised I was not going to make it to my ferry in time so it was time to give up. I needed somewhere to stay that night so I randomly decided to go to Rome since I could go anywhere from there. The pieces all clicked into place nicely after that. I rang up the ferry company to cancel my ticket, but discovered I could change it to the next sailing in two days time for a mere £20 fee. The hostel in Croatia very kindly said they wouldn’t charge me for cancelling my booking, even though it was technically less than 36 hours as the stated minimum period needed for cancellations on their website. The hostel was quite an expensive one (as in double what I usually pay) so I was particularly glad for that. My train ticket to Rome was pricey at €50, especially on top of all the other money I had already spent that day on train tickets, but it could have been much worse really. If I had managed to rent a car, that would have cost me even more. Like €200 more. Later that night, I finally arrived in Rome at 10pm. I just had the next day to see Roma, which isn’t really enough time for such a big city. But that was okay. I had actually already visited Rome as a quick flying visit with my Contiki tour last year. Rome is a big enough city that does demand at least a week to visit with having so many attractions and things to see and do. Similar to Paris in that you can only scratch the surface. And hey I can always come back another time. I chose just two main attractions to see. The Vatican museum and the bone chapel. Of course I still got to wander by a couple of other familiar attractions from my last visit to Rome. I even got to have a wee pash from a cute Italian man less than five minutes after I met him (wow these guys move fast). I wouldn’t even talk about my romancey stuff in this blog usually, as I prefer to keep my love life private, but I felt this experience was ‘too Italian’ to leave out. I noticed him talking and gesturing in an very Italian manner on his phone by the Colosseum, and he saw me laughing at his conversation as I walked by. He joined me and we had a nice chat as we strolled together towards Circus Maximus. We crossed a street and he held my hand as he didn’t want anything to happen to me (there was no traffic haha). And then when I said goodbye, he wanted to cheek kiss as is the custom in Italy. But it turned into more than just a usual goodbye air kiss. I think he was trying to convince me to stay in Italy. I went back to my hostel and packed my bag. I had already brought my train ticket to get to Bari earlier that day. There was no way I was going to miss my ferry a second time. I set my alarm super early just to be sure. Overall: Neat hostel. It is part of the Europe’s Top Hostels chain and was definitely a good place to party. The pub crawl sounded very cool with a whole hour of open bar for the first hour at the hostel. Yup you read that right. Open bar. I wasn’t going to risk missing my Bari train, and was waaay too exhausted the first night I arrived, so didn’t participate. The wifi was pretty awful though as the only downside.